The Lotus Flower is one of the most beautiful flowers imaginable. So when it comes to Tea, our Lotus Tea follows its example. This elegant, divine beverage is a China Black Tea scented with lotus and blended with equally stunning rose petals. It has a delicate, floral flavour complemented by slight hints of maltiness. The Tea leaves not only blend perfectly with the taste of the lotus flower tea but also offer medicinal qualities when consumed as part of an already healthy and active lifestyle. Lotus Tea, like all Black Teas, contains an abundance of antioxidants, meaning it is capable of combating free radicals in the body, thus slowing down the process of natural, though harmful, human oxidation. In doing so, Lotus Tea can reduce the risks of developing numerous chronic conditions, most notably cardiovascular disease and perhaps even certain types of cancer, according to preliminary scientific research. What is known for sure, however, is that any Black Tea can boost the metabolism, helping the body to burn fat quicker and more efficiently. It can also support immune and digestive system health, as well as improve oral health. Essentially, our Lotus Tea is something special, a beverage best enjoyed on a veranda looking out towards an exquisite garden, perhaps one with a pond enveloped in lotus flowers. Lotus flowers are sacred in many areas of the world, particularly in the east. With the Buddhist faith, in particular, the flower represents a symbol of fortune. It grows in muddy water, which somewhat miraculously is the perfect environment for the flower to flourish. In turn, this gives the flower its first and most literal meaning: rising forth above the murk to achieve enlightenment. It is the first of many meanings, the second being that of purity, with the flower resembling the purifying of the spirit, which is born into murkiness. The third meaning, meanwhile, refers to faithfulness; in particular, that all those who are working to rise above the muddy waters require faith to carry forth. There is another meaning enshrined in the colour of the lotus flower, which is of great importance to practising Buddhists. If a lotus is white, it suggests the purity of the mind and the spirit. If it is red, it refers to compassion and love. A blue lotus flower, on the other hand, is associated with common sense, and regarding Buddhist belief, this means using wisdom and logic to attain enlightenment. 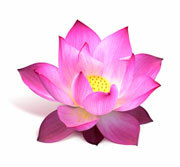 Then there are pink lotus flowers, which represent the history of the Buddha as well as all legends tied to his name. A purple lotus flower speaks of spiritual awakening and mysticism, while finally, a gold lotus flower represents all achievement of all enlightenment, especially in the Buddha. meanwhile, represents full enlightenment and self-awareness. Finally, the lotus flower represents rebirth, both in a literal and figurative sense. A “rebirth” in the Buddhist faith can be anything from an acceptance of the Buddha in one’s life, the changing of ideas, the dawn after one’s darkest day, or the ability to see past wrongs. In a literal sense, the meaning of the lotus flower in Buddhism represents rebirth through reincarnation, which is when the soul leaves this world in its present form to be reborn in another. Perhaps our Lotus Tea cannot offer enlightenment; but nevertheless, it can offer peace of mind, a feeling of calm and presentness, and more than anything, pure happiness. Who would not want that from their morning cup of Tea? How to Serve: This beverage is best served as it is, although milk, sugar, honey or lemon may be considered as optional extras. Tasting Notes: Lotus Tea is captivating to the last. It enchants the soul with beautiful floral aromas and sweet, enticing flavours. It has slightly buttery undertones and a smooth finish. Lotus Tea Benefits: One may think of wisdom and the path to enlightenment with the lotus flower, but when it comes to Lotus Tea, studies have suggested that wisdom can be found, at least in a fundamental sense, through enhanced cognitive function. One such study published in the American Journal of Clinical Nutrition and conducted at the University of Singapore saw some 2,500 people aged 55 or over undergo a test to measure their cognitive function. When the experiment was repeated 2 years later, it was found that those who drunk two to three cups of Black Tea a day during the two year period were 55% less likely to suffer from cognitive decline. Those who drunk six to ten cups, on the other hand, were up to 62% less likely to suffer from cognitive decline.